Baba Yaga (Russian: Баба Яга /'baba jæ'ga/) is a witch (or one of a trio of sisters of the same name) in Slavic folklore, who appears as a deformed and/or ferocious-looking elderly woman. She flies around in a mortar and wields a pestle. She dwells deep in the forest, in a hut usually described as standing on chicken legs, with a fence decorated with human skulls. 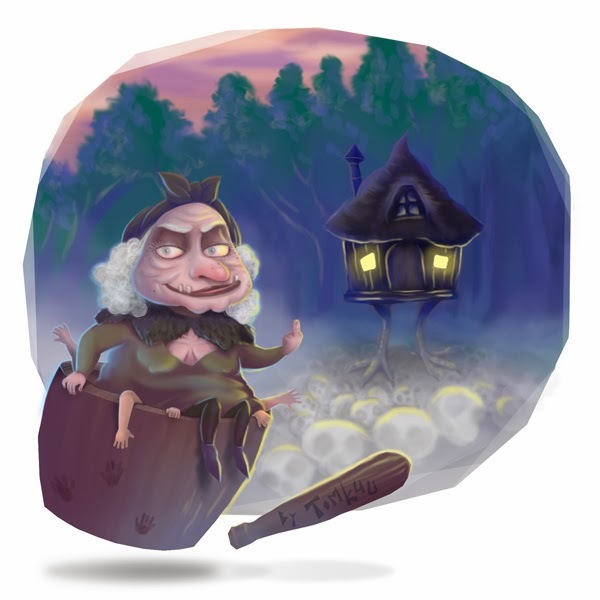 Baba Yaga may help or hinder those that encounter or seek her out, and may play a maternal role. She has associations with forest wildlife. Sometimes she frightens a hero (e.g. by promising to eat him), but helps him if he is courageous. According to Vladimir Propp's folktale morphology, Baba Yaga commonly appears as a donor, a villain, or something altogether ambiguous. In many fairy tales she kidnaps and eats children, usually after roasting them in her oven. Andreas Johns identifies Baba Yaga as "one of the most memorable and distinctive figures in eastern European folklore," and observes that she is "enigmatic" and often exhibits "striking ambiguity." Johns summarizes her as "a many-faceted figure, capable of inspiring researchers to see her as a cloud, moon, Death, Winter, snake, bird, pelican or earth goddess, totemic matriarchal ancestress, female initiator, phallic mother, or archetypal image".